Former Prime Minister seen in public for first time since entering prison. Will return to Maasiyahu prison after two-day furlough. 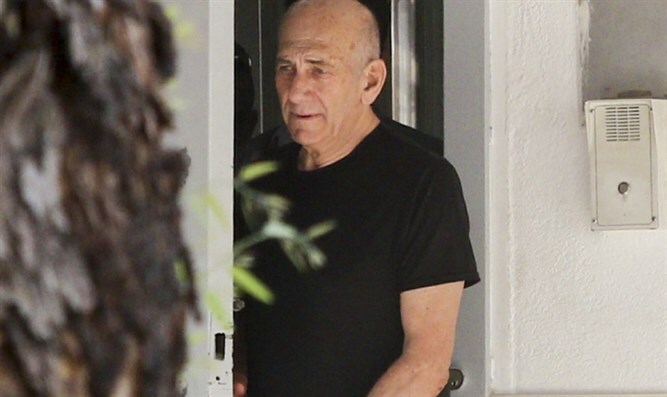 Former Israeli Prime Minister Ehud Olmert was released Monday morning, beginning a 48-hour furlough. The two-day outing marks the first time the former Prime Minister has been seen in public since he began serving his 19-month prison term in February. Olmert, who was convicted of corruption, obstruction of justice, and breach of trust, left Maasiyahu prison in Ramle at 8:00 a.m. Monday morning after he was granted the furlough, following the completion of one quarter of his prison term. The former Prime Minister, who served from 2006 to 2009, was found guilty on two counts of bribery in 2014. Olmert was originally sentenced to six years in prison, two years probation, and a fine of one million shekels ($257,000). Olmert appealed the verdit, however, and in late 2015 his prison sentence was reduced to 18 months. In 2016 Olmert was sentenced to an additional month in prison for obstruction of justice.